A couple months ago I was contacted by email to help identify a Schmitz-Horning Co. frieze or wallpaper pattern. The only information available was the manufacturer name “Schmitz-Horning Co., Cleveland, Ohio, Made in U.S.A.,” the pattern name “Maytime,” and the pattern number “8015,” Section A and Section C. The person was renovating an old home and was curious to see what had been under the layers of wallpaper. Home being renovated by new owners uncover under layers that wallpaper by Schmitz-Horning was used. Schmitz-Horning Co., Cleveland, Ohio wall frieze border uncovered in home renovation. Maytime identified as old wallpaper pattern used in old home. After some time searching the family archives, I was able to locate the pattern in Schmitz-Horning Company’s 1937 Kro-Mura™ Wall Decorations Catalog, pages 14 and 15. It was a beautiful fairy-like scenic color lithograph wall covering design, and send images of it to the contact. It is unclear when the pattern was initially produced. It was rewarding to uncover some of the history of the old home and share in the discovery of this long lost wallpaper design. Maytime. This beautiful scenic paper reminds one of fairy-story illustrations. Its unusual charm lies largely in this fairy-lore interest, its dainty handling and refined coloring. Maytime wall covering pattern by Schmitz-Horning Co. 1937 Kro-Mura catalog specification page. Maytime, No. 8015 – Green and pastel, Maytime wall covering pattern by Schmitz-Horning Co. catalog specification page. Maytime, Section A, B, C, D, Maytime wall covering pattern by Schmitz-Horning Co. catalog specification page. Archibald Willard, Friend to Hugo Max Schmitz of Schmitz-Horning Co. It is believed that in the 1890s, a promising artist left his family and relatives in Milwaukee, Wisconsin, and made his way to Cleveland, perhaps attracted to its thriving art community. He was Hugo Max Schmitz (1867-1938), my great grandfather, and in his mid-30s. Hugo, of German descent, joined Cleveland’s Art Club (formerly know as The Bohemians) and attended regular drawing sessions in its location above City Hall, and participated in their exhibits and possibly traveled abroad with other artists. President of the established Art Club (and also co-founder and trustee) at the time was notable northeast Ohio artist Archibald MacNeal Willard (1836-1918). He was best known for his painting of The Spirit of ’76. He was born in Bedford, Ohio and at the age of 17 moved to Wellington, Ohio. There is a museum in Wellington in his honor. Photo portrait of Archibald Willard, restored (Schmitz family archives). Archibald Willard was a prolific artist who worked in a variety of mediums and subject matters. He was a talented portrait artist as well as landscape artist. In addition to the Wellington museum, several Cleveland museums carry his work including the Cleveland Museum of Art and Cleveland History Center/Western Reserve Historical Society. A dedicated plot just east of Cleveland City Hall is known as Willard Park. A search in Cleveland’s The Plain Dealer archived newspaper articles, resulted in stories about Cleveland artists which included Archibald Willard and photos of him working in his studio. Archibald MacNeal Willard in his studio (Source: Cleveland Plain Dealer, December 17, 1899, Several of Cleveland’s Well Known Artists Seen At Work In Their Studios). He had a friendship with Hugo, and gave him a portrait photo of himself, plus as a wedding gift in 1902 an original landscape oil painting, which resembles the area’s Chagrin River. In addition my great grandfather received a small statue of The Spirit of ’76 from Mr. Willard, which may be a one of a kind working prototype in porcelain by Stanway. Hugo Max Schmitz co-founded the Schmitz-Horning Company in 1905, a well-regarded scenic wall paper and mural manufacturing firm, and was president of the company until 1938, when his son Warren Reynolds Schmitz ran it until the company’s closing around 1960. Landscape oil painting by Archibald Willard (Schmitz family archives). Statue of Spirit of ’76 by Archibald Willard (Schmitz family archives). In April 2011 when I began my research into family-owned Schmitz-Horning Company (Cleveland, Ohio, 1905-1960), a prominent high-end mural and wall covering manufacturer and printer (co-founded and run by my great-grandfather and later by my grandfather), two things happened. First, I discovered a black and white photograph of the building from around 1925 in our family documents. Second, after Googling the building’s address of 777 E. 82nd Street in Cleveland, search results showed it was being occupied by an industrial chemical company, and the building looked well maintained from the photo on Google street view. Excited about the find, it was my intention to go see the building. Several months rolled by and I Googled the business address again and many recent articles dated June 27, 2011 came up stating that an accidental fire had destroyed the building, most likely started by roofers, drawing 60 firefighters from 15 departments — a triple three alarm fire! Fortunately, no one was injured. Initially, the owner announced plans to rebuild on the same site but renovated offices were built directly across the street in other facilities owned by the company. The site where the building once stood is today a lot for parking and storage of machinery and equipment. Schmitz-Horning Company of Cleveland, Ohio (1905-1960) was recognized on a global level as a high-end large scale chromolithograph designer and manufacturer of art murals and posters, wall decorations and wall coverings. The company advertised in architectural and decorating trade magazines, and produced postcards with their patterns, and fully illustrated catalogs. The original wallpaper and mural designs were meticulously drawn or painted by skilled artists then transferred onto lithographic plates, the largest in the country at the time, with the imported zinc plates exceeding 40″ x 80″ in size. Expert catalog illustrators recreated the patterns and rendered interiors showing their applications. These catalog illustrations are beautiful and demonstrate a high degree of artistic ability and design. Some of the catalogs themselves exist in our family, as a record of the business that my great-grandfather (H.M. Schmitz) co-founded and ran, and of which my grandfather (W.R. Schmitz) later oversaw. Here are some of the Schmitz-Horning Company catalog illustrations, created and signed by B.E. Sutton, Anne Nolan, and D. Scott Brown or Scott D. Brown, D.S. or S.D., and other unidentified yet talented artists. Schmitz-Horning Co. pattern Chinese Floral, catalog illustration by D.E. Sutton. Schmitz-Horning Co. pattern Elysia, catalog illustration by D.E. Sutton. Schmitz-Horning Co. pattern Marguerette, catalog illustration by Anne Nolan. Schmitz-Horning Co. pattern Valencia, catalog illustration by D.S. or S.D. Schmitz-Horning Co. pattern Valencia, catalog illustration by D. Scott Brown or Scott Brown D.
Hugo Max Schmitz and Warren Reynolds Schmitz, presidents of Schmitz-Horning Co.
Hugo Max Schmitz holds his young son Warren Reynolds Schmitz, in 1905. Schmitz-Horning Co., and mural and wall covering manufacturing and printing company, was founded around 1905 (or possibly earlier) in Cleveland, Ohio by Hugo Max Schmitz and William Horning (“Will” or “Bill”). They were artists and lithographers. Hugo was born in Wisconsin and traveled to Cleveland in the late 1890s, joining the Art Club, and befriending (and even traveling with) several established area artists. He was a talented artist, and wanted to offer high quality art that was affordable for people’s homes, thus the idea of reproducible art murals and papers. Hugo was acting president, and Mr. Horning sold his interest in the company around 1920. Around 1926, Hugo’s son, Warren Reynolds Schmitz, came to work at the company as Vice President and worked in sales after graduating from Miami University of Ohio (where he excelled in Debate Club). Hugo Max Schmitz of Schmitz-Horning Company, Cleveland, Ohio. Hugo was my great-grandfather and Warren was my grandfather. The company had longevity in its employees, and many had multiple family members who worked there. They printed on two of the largest chromolithographic custom presses in the world (a third one being in London), and oversized zinc plates had to be shipped from Germany. The color lithographs exceeded a 40″ x 80″ sheet size and were printed in oil-based inks on high quality paper and were fully washable. It was most likely one of the top ten wall covering manufacturers in the country of its time, and Hugo Schmitz was considered and authority on the Frieze, a continuous pictorial wall mural, and published articles in Decorator and Architectural trade journals. In 1938, Warren Schmitz became president of Schmitz-Horning, after a tragic automobile accident and death of Hugo, 72. Also killed was family friend Margaret A. Hale, 66, wife of the late George W. Hale, builder of Cleveland’s Alcazar Hotel. Hugo’s wife, Pauline “Queen” Reynolds Schmitz was injured but survived. After the death of Hugo Max Schmitz, Schmitz-Horning Co. was run by his son, Warren Reynolds Schmitz. With Warren at the helm, he produced new patterns and product lines including scenic panoramics, working with several notable area artists, and developed sales and marketing materials including catalogs and small-scale wall scenics view books. Warren Schmitz (“Bud”), ran the company until around 1960, and Schmitz-Horning Company closed. A bookkeeping document shows that a sale of S-H equipment to another local wallpaper firm occurred around 1964. A newspaper ad for the wall coverings sold through The May Company can be seen in The Plain Dealer in the 1964. Warren died at the age of 65 in 1970. The Schmitz-Horning Co., a chromo-lithographic wallcovering firm, was in business 55 plus years, from 1905 to 1960. But the company may have started in 1903 as a litho poster production company and then developed their own line of wall murals, friezes, and scenic wall papers around 1905, branded San-Kro-Mura. They offered an attractive yet inexpensive product line, using oil-based non-fading color oil-based inks printed on high quality paper that was sanitary or fully-washable. Later as new scenics and panoramics designed, the brand Kro-mura was created. They rented space at the Whitney Power Building or Power Block at E. 10th and Power Ave., between St. Clair and Rockwell, and later moved to their own building at 777 E. 82nd Street in Cleveland, near Gordon Park. In 1906 a patent was registered for the ‘Frieze’ by co-owners Hugo Max Schmitz and William Horning, along with their head salesperson, Warren R. Cox. The Frieze was a repeating continuous scene which surrounded the room at the top of the wall. In the early years it would take two years to complete the plates for a single scenic. The 43″ x 83″ hand-fed lithographic presses used were the largest in the world. The company custom built three, Schmitz-Horning had two, the other being in London, England. Zinc plates had to be shipped from Germany. The company produced some of the largest wall maps in the industry. Hugo Max Schmitz (1867-1938) (my great grandfather), co-owner, was an artist who came to Cleveland, in his 30s, in the late 1800s, and was from a large German family in Milwaukee, Wisconsin. He married Pauline (Queen) M. Reynolds in 1902, who was a society lady. They lived in East Cleveland and later moved to University Heights, Ohio. Venice pattern, 30″ x 10′, and original watercolor by Hugo M. Schmitz, Schmitz-Horning co-founder. He was a member of Cleveland’s Art Club, with mostly German members, that met in City Hall. He traveled to Paris and Morocco, and perhaps to Morocco with other artists. In one of these paintings, he painted a cleaning girl from a New York City office building and won an award for it (either second place or honorable mention) at an exhibit at the Metropolitan Museum of Art. Our family has a couple of his original watercolors and oils, including a portrait he did of my great grandmother. They honeymooned in Venice, and a watercolor he did there became a wallpaper pattern called Venice. He was rated as one of the best litho-crayon artists in the industry. William Horning, co-owner, sold his interest in the company to Hugo around 1920, but worked as a lithographer in Cleveland. Warren R. Schmitz (1905-1970) (my grandfather), son of Hugo M. Schmitz, started working at the company after college around 1929 in sales and promotion, and designed sales brochures, books and displays and traveled to various dealers in the U.S. He ran the company after his father’s death in 1938 until it closed around 1960. After time, the company produced small scale salesman samples of the wallpapers for sales calls. Prior to that they were taking long rolls on calls. The same high quality inks and papers were used on the smaller scale versions. Warren Schmitz modernized the product line, obtaining sketches from prominent artists. New sales promotion aids were printed in-house using a small Harris offset press. In the 1950s he appeared on the TV show ‘What’s My Line?’. The company was also featured on a radio segment called ‘On Location’ with young announcer Virgil Dominic, sponsored by The Illuminating Company. Chateau de Province pattern, ten sections, each 40″ x 80″, repeat, designed by Henry G. Keller. Above catalog illustration, below section of actual paper (detail photo: Cooper Hewitt). Henry G. Keller (1869-1949) was a Cleveland School Artist and taught there. He designed the pattern, Chateau de Province, while in his prime. It was a French rural scenic, an included a chateau, native trees, and a fox hunt of equestrians with horses. It was 10 sections, each near 33″ x 72″. Carl Fuchs designed Old South, believed in the 1940s, of plantation life in early America, including a steamboat and fox hunt. There were twelve sections, each 40″ x 80″ in repeat pattern. Old South pattern, 12 sections, each 40″ x 80″, repeat, designed by Carl Fuchs. Section of actual paper (detail photo: Cooper Hewitt). Lou Ramacciato, began working at Schmitz-Horning after graduating from Cleveland Institute of Art in 1946, and later went on to work 28 years at the Cleveland Museum of Art restoring art and preparing gallery exhibits. 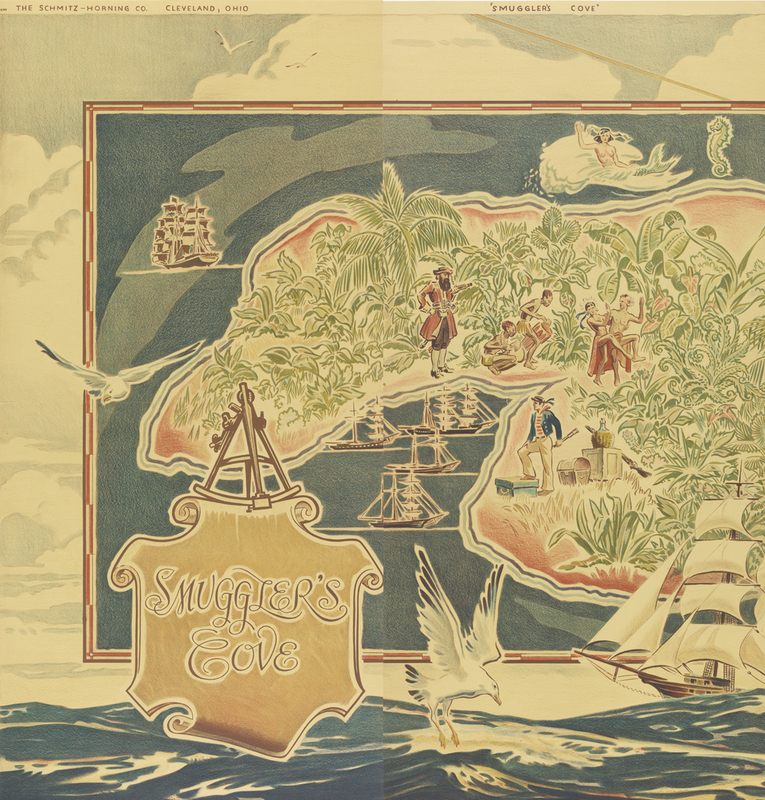 Robinson Crusoe Pictoral Mural Map, one panel 40″ x 60″, designed by Glenn M. Shaw. Above catalog illustration, below section of actual paper (detail photo: Cooper Hewitt). Glenn M. Shaw and Elsa Shaw had a studio in Lakewood and both worked commercially and taught. Elsa did some design work for them, though Glenn designed a number of patterns for the company, including 5 illustrated maps which were said to be accurate, the Old Canal set which depicts the Ohio and Erie Canal between Cleveland and Bath, Ohio, and Old Dominion which is a set of 7 panels. Each panel is 30” x 80” plus, could be trimmed at the desired height. He is known for painting murals in three post offices, in Canton, Warren, and Perrysburg, Ohio. Paul A. Meunier was a litho artist, from Hunting Valley, who worked at the company for 11 years. Two other family members worked there, Ovid Meunier for 25 years and Laurence Meunier for 7-10 years. After leaving Schmitz-Horning, Paul became partner then owner at R.E. May, a plate-making company, that is still in existence today on E. 24th Street in Cleveland. I found an old brochure page on their website which shows Paul, and in another photo on the same page is a small-scale Schmitz-Horning western mural, called Wells Fargo. The Western Reserve Historical Society has a full size set of the pattern in their collection. Wells Fargo pattern, 5 sections, each 40″ x 80″, repeat (artist unknown). I found a still life watercolor by Paul Meunier on ETSY in 2011, and his name plate appeared on the back of the framing. He painted it in 1937, during the span of time when he worked at Schmitz-Horning. He wrote a book on the history of Gates Mills, Ohio, and there is an award in his name at the Gates Mills Art Show. I read that a painting of his was in the chamber room of their city hall. He enjoyed drawing, printmaking, and painting wildlife and horses. Paul A. Meunier, watercolor or gouache floral painting, 1937, employed at the Schmitz-Horning Co. 1927-1938. Ed Sinz worked at the company for 35-40 years. We have Christmas cards, to my grandfather from the sculptor Walter Sinz around the 1940s, possibly Ed’s son or relation. Here is a comprehensive list of known artists or litho artists that worked at the Schmitz-Horning Co., either on staff or assignment-based, as designer and/or litho artist. H. Stief Company/Harvey G. Steif, Inc.
Lotus Garden pattern catalog illustration by B.E. Sutton. When I began to uncover material from the company in our family home, it sparked my interest. Starting with my first blog post about Schmitz-Horning in 2011, I began writing a series of blog posts, and started to receive many inquiries about the company and patterns. I hope to continue my research and produce a publication on it one day. For design and wallpaper lovers, Cooper Hewitt, Smithsonian’s Design Museum, has an entire section of wall covering samples from the Schmitz-Horning Company of Cleveland, Ohio. As a gift of the Wallpaper Council, Inc., the collection has dozens of patterns and color variations, printed as chromo-lithographs, mostly believed to be from the 1930s and 1940s. The company was known for upscale lithographic wallpaper, friezes, art murals, and scenic panoramics, printed with oil-based inks onto high-quality paper, and was in business between 1905 and 1960. They used some of the largest zinc printing plates in the country, with an image area of roughly 80″ x 40″. The paper was fully washable. The design museum owns one full set, a four-part scenic mural called ‘Scenic Hudson,’ a lovely pattern that they describe, “captures a romantic view of the Hudson River.” What’s also great is that Cooper Hewitt includes a detailed description of the work with accompanying audio. This set was the gift of Scott Cazet. Additionally, Schmitz-Horning offered a selection of large-scale wall maps. The Cooper Hewitt museum has two adjoining sections of a beautifully illustrated map, ‘Smuggler’s Cove,’ designed by established Cleveland area artist Glenn M. Shaw, who contracted on several designs with the company. Again, the museum offers details and audio on the pattern. Smuggler’s Cove by Schmitz-Horning Co., 1930-1940, Cooper Hewitt, Gift of Wallpaper Council, Inc. Although the museum is still in the process of digitizing the samples to post on their website, I have created a category on my Pinterest page of Schmitz-Horning work currently on their site. I have a special interest in the history, since my great-grandfather, Hugo M. Schmitz, co-founded and served as president of the company, until his death, when it was then operated by my grandfather, Warren R. Schmitz. I am thrilled that these samples were preserved and thanks to the digital age they are now being shared. Cooper Hewitt has undertaken a huge (ongoing) effort to make the Schmitz-Horning Co. samples available as resources for the general public, researchers, and enthusiasts. Cooper Hewitt / The Schmitz-Horning Co.
(Pictured) Chinese Embroidery Scenic-Panel by Schmitz-Horning Co., 1930-1940, Cooper Hewitt, Gift of Wallpaper Council, Inc.
Chinese Embroidery Scenic-Panel by Schmitz-Horning Co., 1930-1940, Cooper Hewitt, Gift of Wallpaper Council, Inc. Images from Cooperhewitt.org used under the Fair Use copyright act.